Halloween themed fine motor activities. 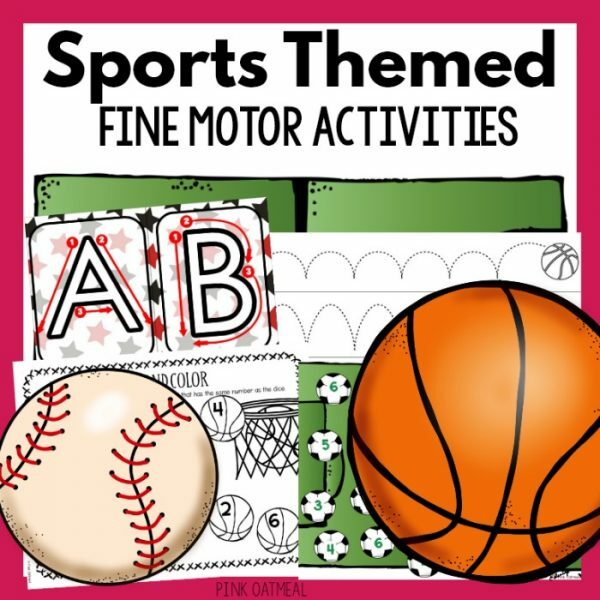 A fine motor activity pack that is perfect for preschool and kindergarten age kids. 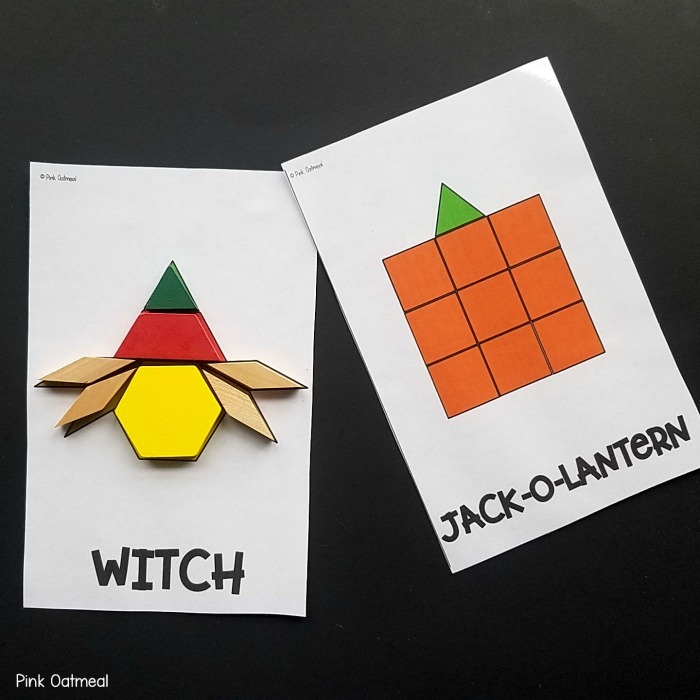 This pack of Halloween themed fine motor activities works great for a classroom, occupational therapy, or for use at home. You will receive a downloadable PDF and will not receive a physical product. 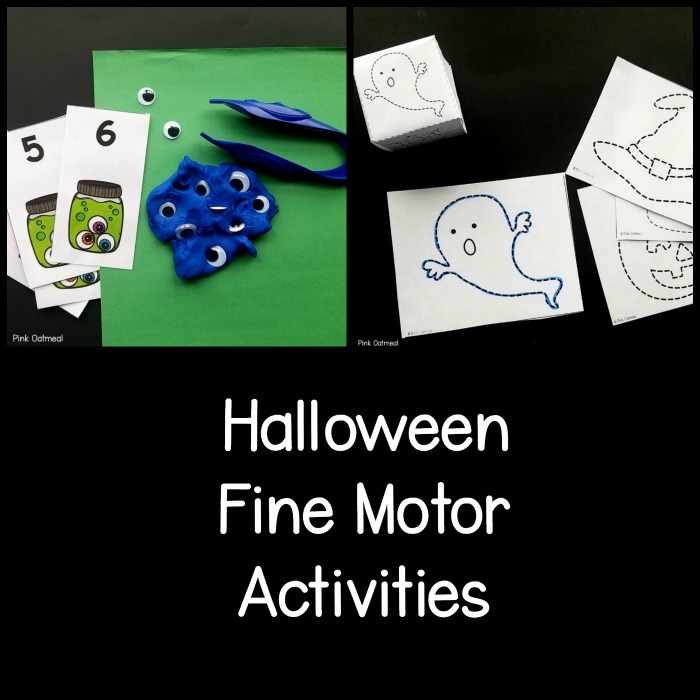 Halloween fine motor activities pack. Fun activities that work on building fine motor skills all with a Halloween theme! 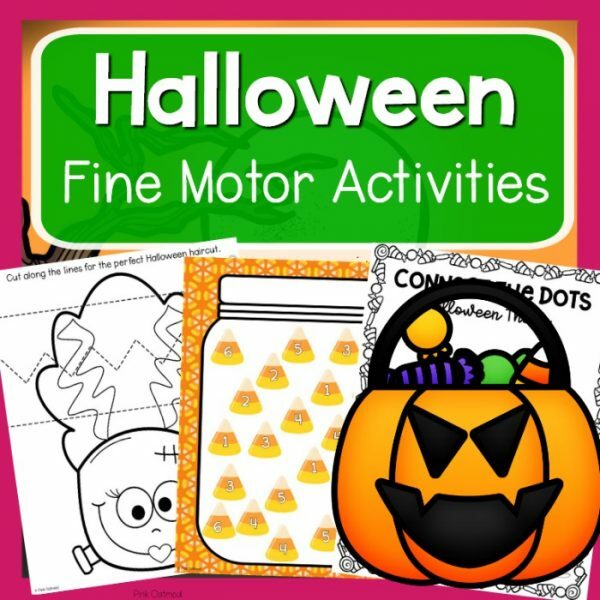 Your kids will love the variety of Halloween themed fine motor activities included in this packet. Prep the packet once and use over and over again! 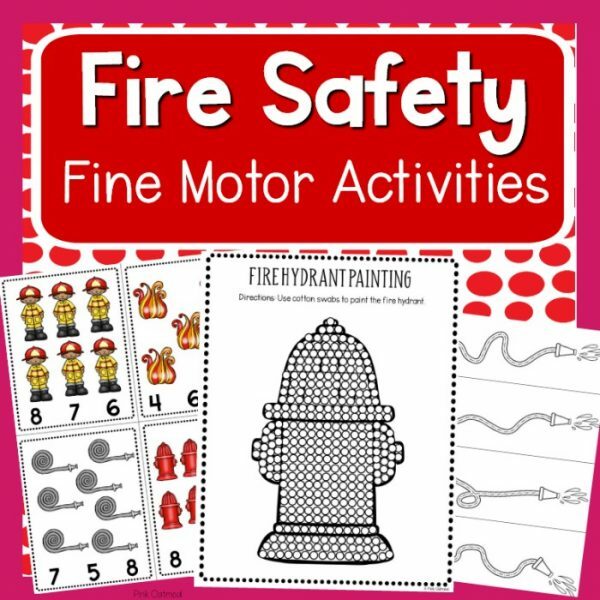 The fine motor activities are great for pre-k and kindergarten aged kids. The packet includes a variety of activities that the kids will enjoy. 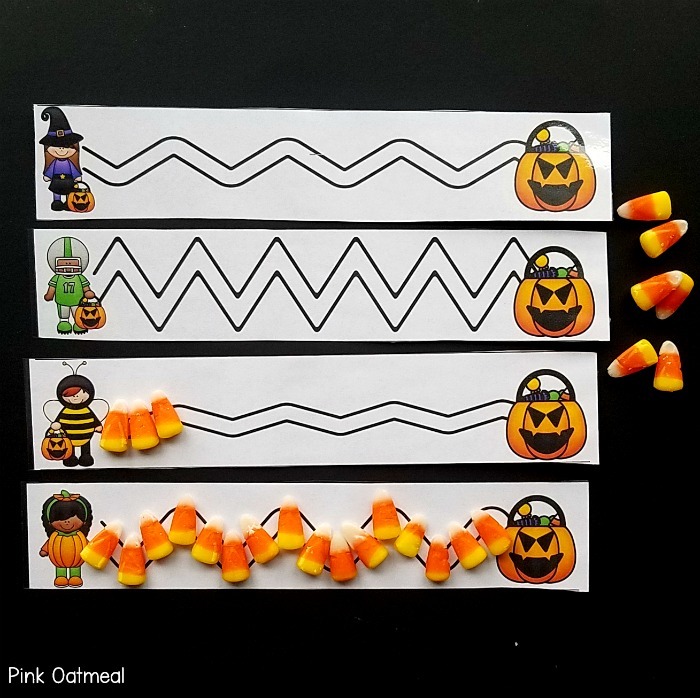 The Halloween fine motor activities are great for a classroom, occupational therapy, or for home. 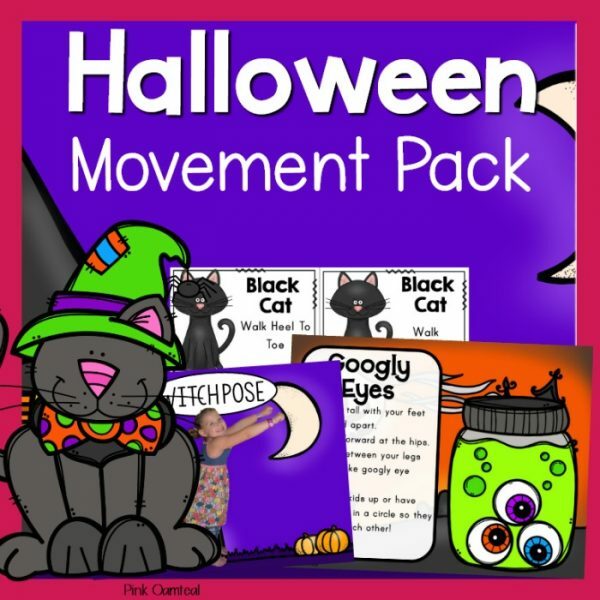 Use these activities for the month of October and for all things Halloween. The packet includes 9 fine motor pre-writing strips. Pre-writing skills are lines and strokes that need to be mastered BEFORE learning how to print the alphabet. Each is developed in a sequence. Laminate (for extended use) and cut out pre-writing strips.Use a dry erase marker for tracing on the pre-writing strips, so it can easily be wiped off lamination and re-used again. Pre-writing strips can be practiced in multiple ways. Manipulatives are a perfect way to work on pre-writing strokes. Using candy corn is a fun alternative during the Halloween season! 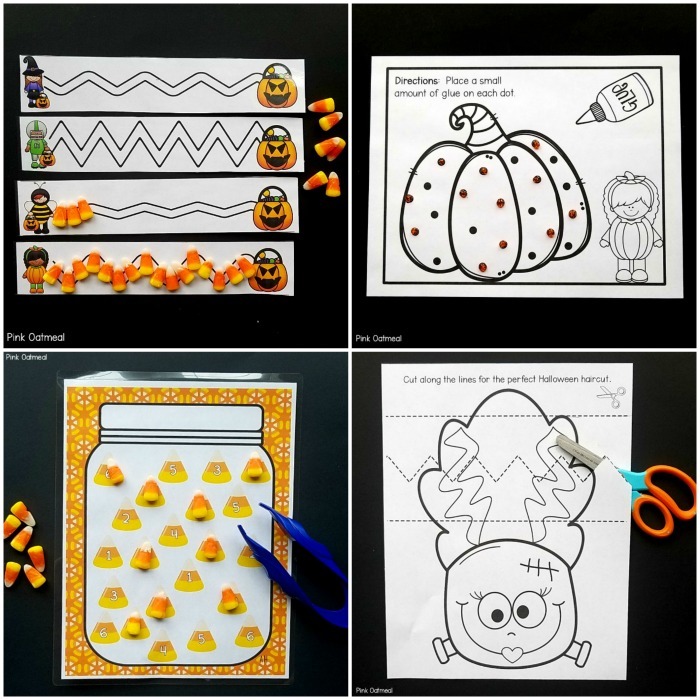 Laminate and cut out candy corn strips or use as full sheet printables, and use candy corn to follow paths. 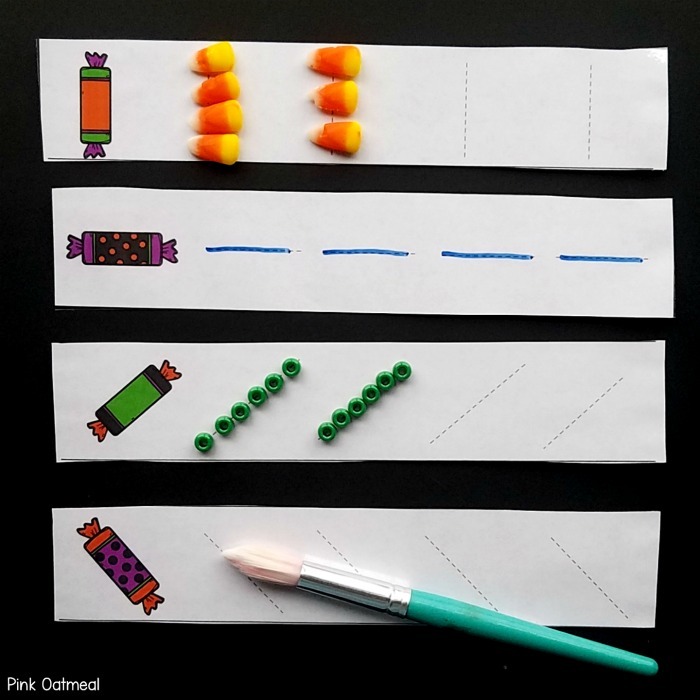 If you don’t want to use candy corn other manipulatives or tracing the paths will work well too. I recommend laminating for repeated use. Use a dry erase marker if tracing paths for easy wipe off. For this activity you will need glue or glitter glue to add a little fun. 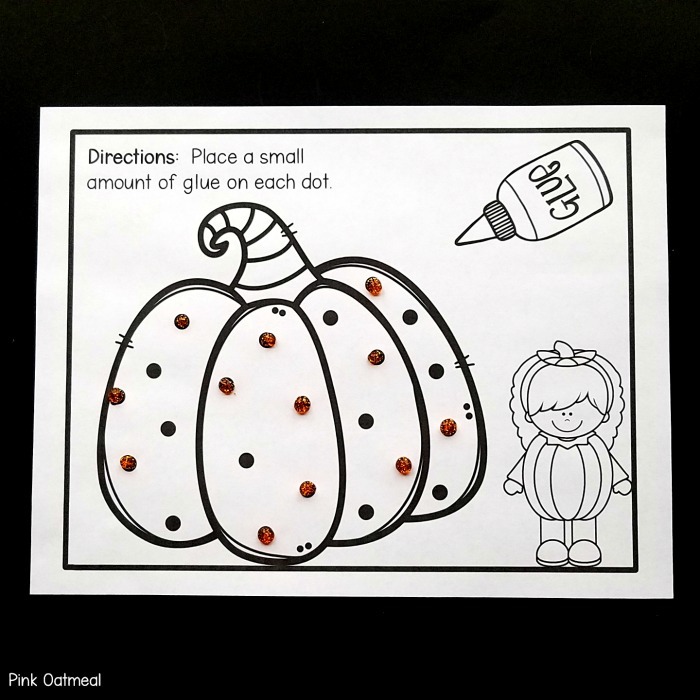 Place a dot of glue on each dot of the worksheet. 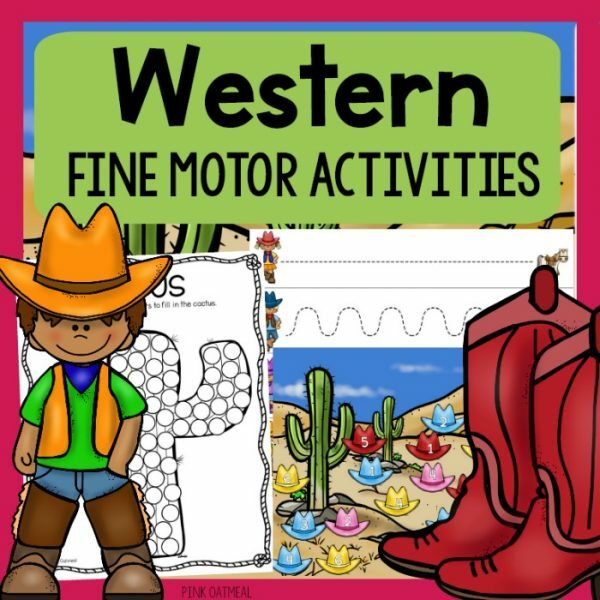 There are 3 different worksheets to choose from for this fine motor skill. This Halloween themed fine motor activity consists of two parts. First, you will need to laminate and cut out Halloween tracing images. Next, you will need to cut out and create dice. 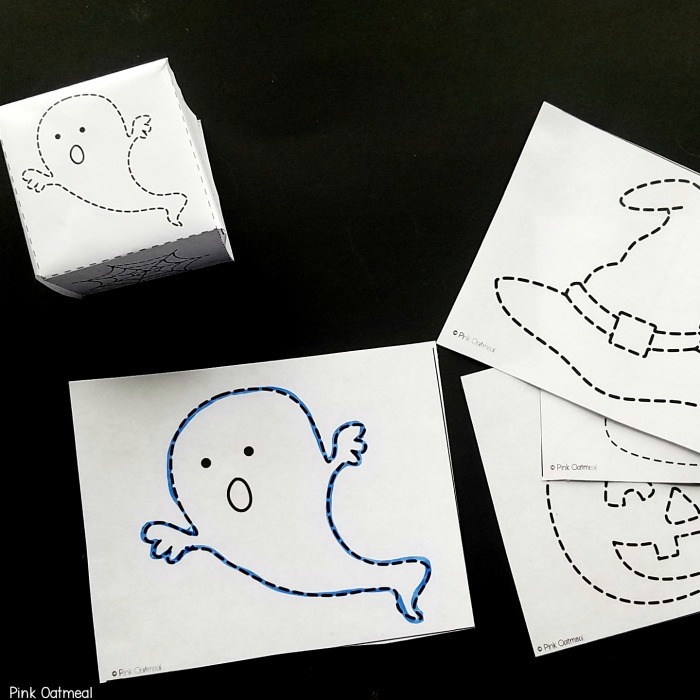 Make Halloween tracing a game by rolling the dice and tracing the card that comes up on the dice. Repeat this game until all of the Halloween theme objects have been traced. To play the candy corn roll you will need a dice and tongs, but fingers will work too. Print and laminate candy corn board for longevity. Start playing the game by rolling the dice. Find a piece of candy corn that has the same number as the dice. 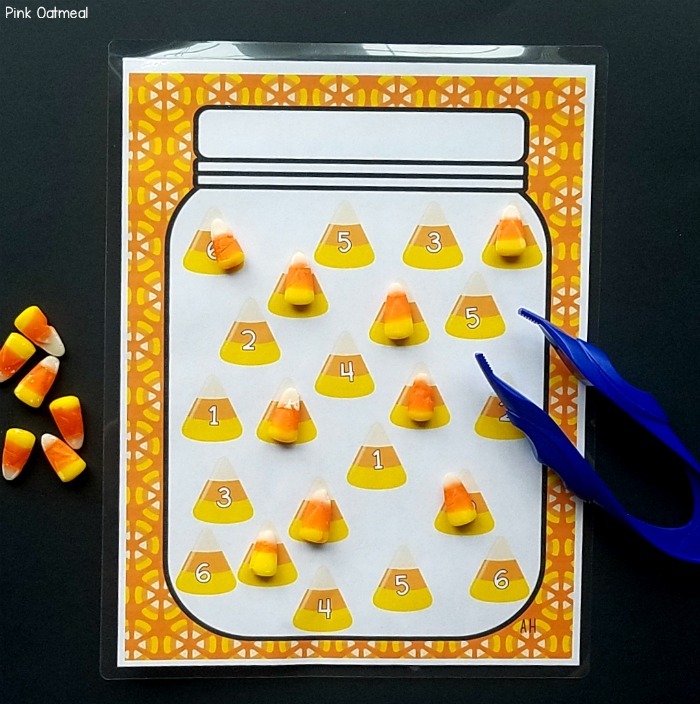 Cover the candy corn on the game board using a piece of candy corn.= by transferring it to the board with a tongs. The Halloween haircut activity is the perfect way to work on scissor skills with a Halloween theme. 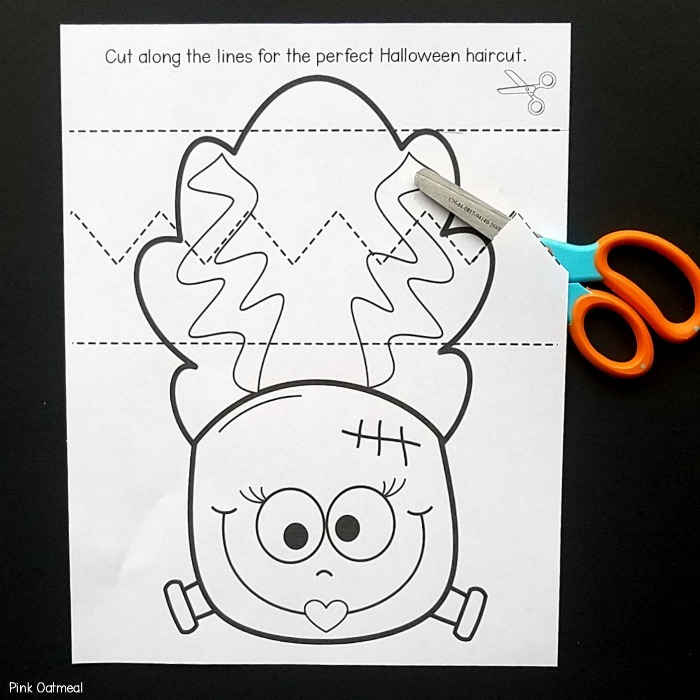 Print the Halloween haircut sheet and begin cutting for this Halloween themed fine motor activity. 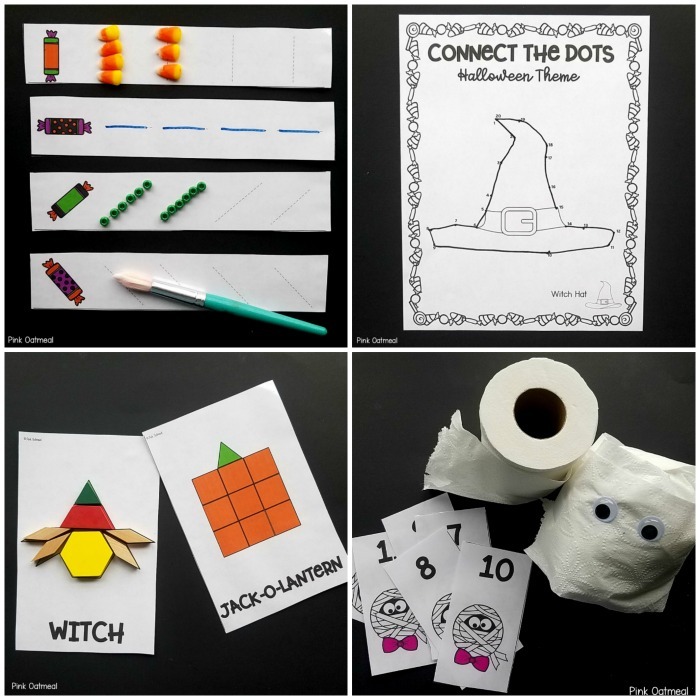 Work on pencil control and fine motor skills with the Halloween themed connect the dots activities. 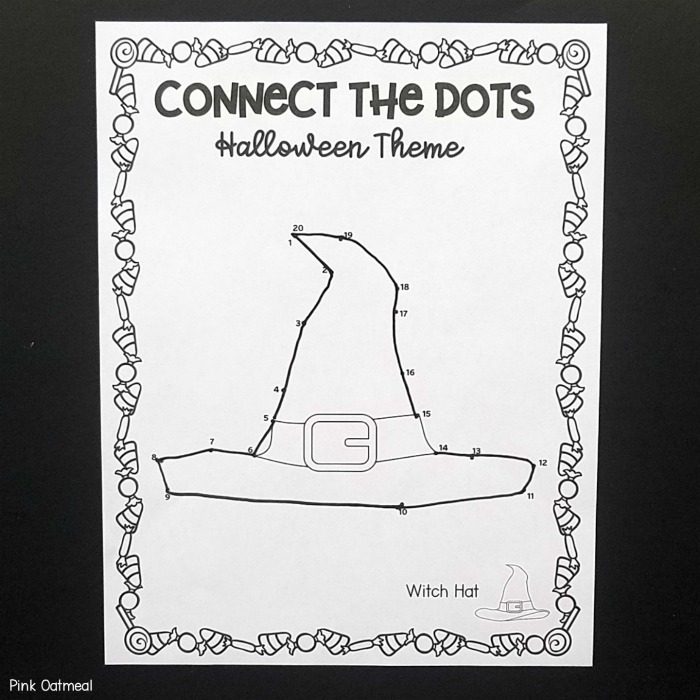 Included in this packet are two different Halloween themed connect the dots activities. Print and laminate the sheets for repeated use. A set of tongs, monster eyes, and either play dough or slime will be needed for this activity. 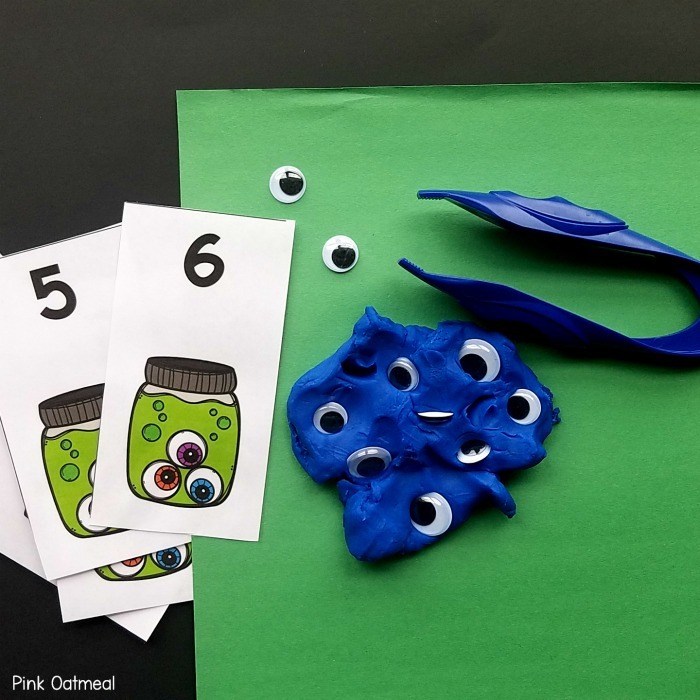 Pick a monster eyes card and remove the number of eyes from the play dough or slime as indicated by the monster card. Your kids will love this Halloween fine motor activity! 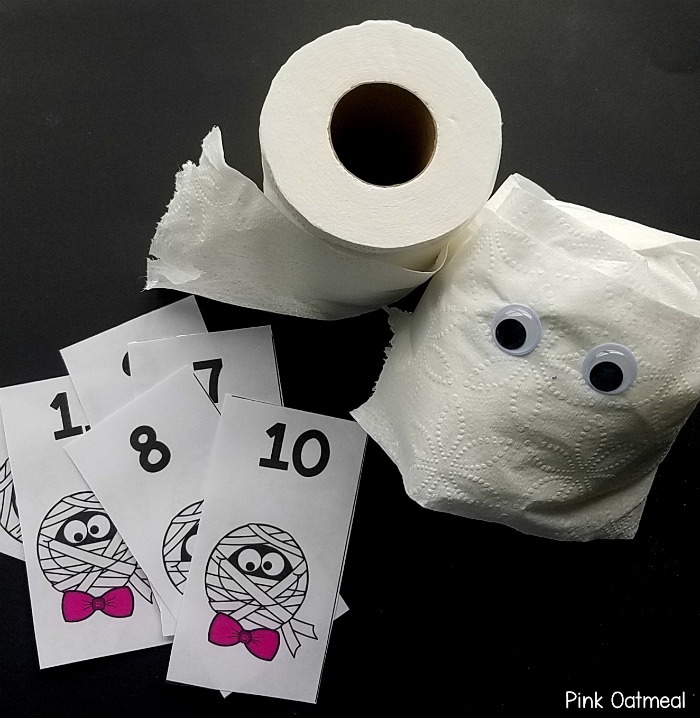 Wrap up a mummy with toilet paper, streamers, or yarn. Draw a mummy card to see how many times you will need to wrap your mummy. This can be done on a small ball, person, pool noodle or balloon. Add a set of eyes when you are all done wrapping! 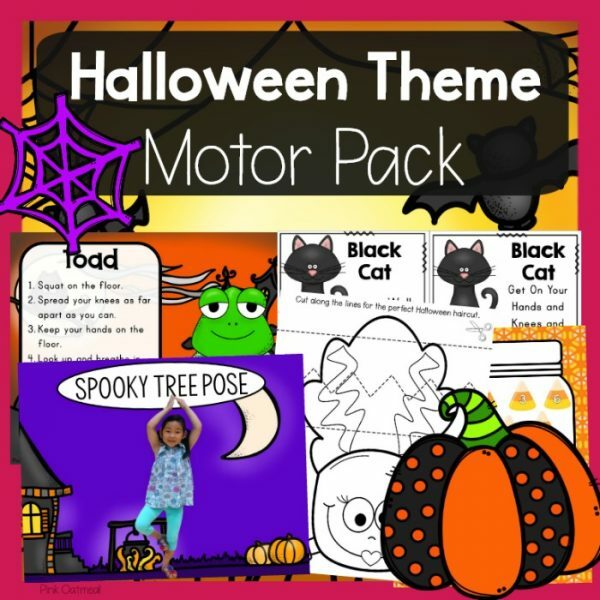 Get five different Halloween themed pattern block activities in the Halloween themed fine motor pack. Work on fine motor skills while working on pattern blocks!